I love that I live in a world where a working class 6’5′ tall gay black man in a wig, makeup and a fancy dress can grow up to become a truly iconic pop legend who now arguably stands, at the age of fifty four, at the height of an already long, enduring and impressive career. Currently storming the Billboard charts with a new album (Born Naked) and single (Sissy that Walk) and ruling the airwaves as creator of a truly unique “what the hell were they thinking, and yet DAMN it works!” television show called RuPaul’s Drag Race, the original Supermodel of the World appears to be, as always, an unstoppable force of nature. Sure, at times things get formulaic, with certain “characters” or archetypes showcased each season….someone inevitably “plays” the ingenue, the villain, the front-runner, or the dark horse. But regardless, Drag Race pulls the curtain back on the great illusion by showing us the true lives of the real honest to goodness MEN that live behind the glittery makeup and the sequined gowns. For some, it’s a passion and a calling, for others its a form of creative expression and for others still it’s simply how they make their living, a job like any other, even if it’s unlike anything we’ll ever know. What’s often remarkable about the show is that it finds the balance between showing the light and not taking any of this all too serious, and yet uncovering the dark corners and the earthy realness of it all. While it pokes fun at its subjects, it never makes fun of them, and it always presents the queens in a very real, very human light. These queens have experienced their fair share of trials and hardship, with many facing hatred, discrimination and non acceptance on an almost daily basis n their “real” lives. Some are very forthcoming about their stories, while others more guarded….but eventually everyone tends to break down in what’s proven to be some pretty vulnerable and refreshingly unscripted moments. Well, that and the vodka helps! For all it’s participants, Drag Race is a study in fearlessness, strength, and resiliency . It portrays a group of people who are true survivors – battered but never broken – and we see an evolution for many as they discover things about themselves as yet unknown, and have the chance to form an even stronger and fiercer persona before unleashing it upon an often cruel, ignorant, and now unsuspecting world. I didn’t always understand drag queens, or the desire to dress up (I haven’t always been this enlightened creäture before you, you know). For one thing, these shoulders would not look pretty in anything spaghetti strapped, I can barely walk a straight line in sneakers let alone heels, and don’t think for a second you can ever tame these eyebrows. But in all seriousness, I suppose my not understanding came from a place of fear, or perhaps some feelings centred around some internalized homophobia once upon a time. But not anymore. RuPaul and Drag Race helped change that….helped change both my understanding, my perception, and my world view on what drag really means. On what being gay really means. On what being YOURSELF really means. In our world today, there are literally millions of school age LGBTQ children. And among that staggering statistic live an inordinately large number of scared, helpless, hopeless children who spend their day planning – not what they’re going to wear or what team they might try out for or what movie they might like to see – but instead how to survive from being bullied, harassed and shamed for being who they are, or how to hide and suppress what they really feel inside just so they might find some peace on the outside. They have to plan for their safety each and every day, how to look, how to talk, even how to move…and those that love them need to equally fear for the harm that might come. How awesome is it that some weird gay kid who’s struggling to find their place in the world – that are being bullied for being too femme or too butch, that are being tortured because they were born a boy when inside they feel like a girl, or vice versa – can now turn on the TV today and see this colourful cast of admirable characters living their lives out loud, leading the charge for the rest of us as they do what we all want to do…be their own true masters of their own true destinies. And if you disagree with that, then I guess you’ve never felt that pain or been that scared kid…or had to worry about one. 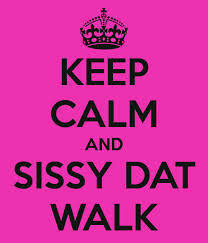 I hope RuPaul’s new single Sissy That Walk, in all it’s success with its huge dance beats and simple yet catchy lyrics, becomes an anthem for those leading the way, for those that have walked the road already, and for those about to head down the path. Not “just” a gay anthem, but an anthem for us all. Sissy that walk, butch that stroll, glam that runway. However you do it, just be that beautiful, unique creature, unlike ANY other, you were born to be. THANKS for that message Mama Ru. Go to YouTube to watch the official Sissy That Walk video starring RuPaul and legends in the making Bianca Del Rio, Adore Delano, Courtney Act, and Darienne Lake.